Since the main goal of your store would be to sell your products in this tutorial we will show how you should be adding the products for your Store via the admin area of the PrestaShop application. First of all you should login into the admin backend of your application and access the Catalog>Products section. There is the place where all of the products on your store should be managed. Once you access the products management page you will be able to locate the Add New Button from the top horizontal menu so you can begin adding your products. And many more options which you can configure based on your needs. By default the product will be added to the default Home category of your Store. 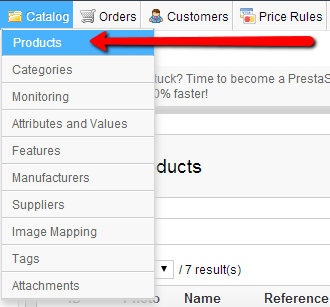 If you would like to add the product to a specific category you should be able to do so via the Associations tab located in the product management page. If you would like to create your own category and to add the product in it please check out our other tutorial for PrestaShop on How to add a product category to your store in PrestaShop. Congratulations! You have successfully added your new product!